Bring the New EcoBoost Fiesta 1.0 Turbo to life with the brand new edition Flexi Decat Pipe from Pumaspeed and Milltek Sport Exhausts. The OE pipe has a huge restriction this Decat is a full 57mm bore and allows Full Flow and full Power for all 100PS and 125PS engines. Will this decat bring the Engine Light on ? In our testing we have found that the Mil light on the dash will come on. To turn the engine light off we would suggest the MIL Elbow be purchased and installed at the same time as this pipe. Will this pipe fail the yearly emission test (aka MOT in the UK) ? Yes, the MOT and all emission tests do rely on the catalyst to function to enable an emission test pass.However there is an alternate product, the Milltek Sport High Flow Sports Catalyst that will allow the car to pass the emmision test year after year with no problems. The Pumaspeed Workshop team are ready to fit the Milltek Sport Fiesta 1.0 EcoBoost Large Bore Downpipe and De Cat in our Head Office located here. Therefore making parts and labour a total cost £365.89 (inc. VAT). 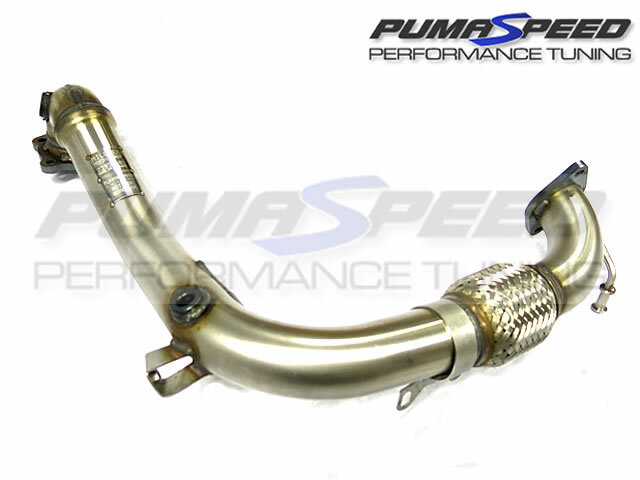 Pumaspeed have a specialist distribution team that can dispatch the Milltek Sport Fiesta 1.0 EcoBoost Large Bore Downpipe and De Cat to any destination worldwide.